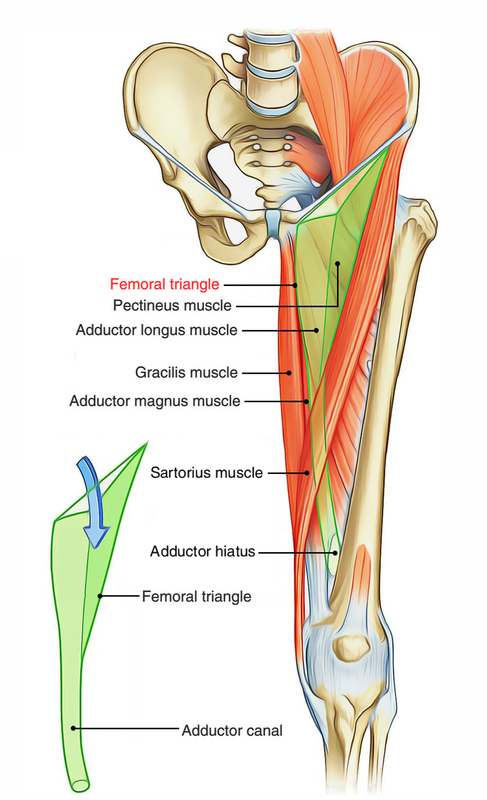 Femoral Triangle is a triangular depression on the very front of the upper one-third of the thigh below the inguinal ligament. Its apex is pointed downward. Lateral: Medial border of sartorius. Medial: Medial border of adductor longus. Apex: It’s created by the meeting point of the medial edges of adductor longs and sartorius. Roof: The Roof of a Femoral Triangle is created by the fascia lata having saphenous opening. The superficial fascia overlying the roof includes superficial branches of the femoral artery and accompanying veins, upper part of great saphenous vein, superficial inguinal lymph nodes, femoral branch of the genitofemoral nerve, and branches of ilioinguinal nerve. Femoral artery and its branches. 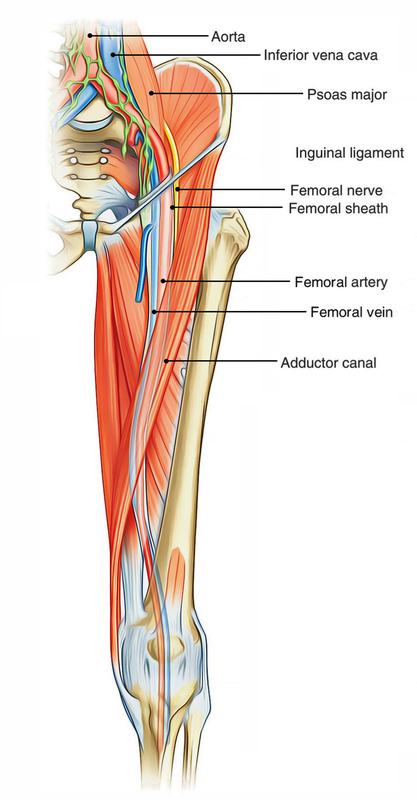 Femoral vein and its tributaries. Lateral cutaneous nerve of the thigh. Femoral branch of the genitofemoral nerve. A short account of some contents of the femoral triangle is supplied in the subsequent text. The femoral artery traverses the Femoral Triangle from the midpoint of its base to the apex. The artery enters downward and medially. Consequently, in the base of triangle, it is located lateral to the femoral vein but at its apex it is located anterior to the vein. The femoral artery gives 3 superficial branches (superficial epigastric, superficial circumflex iliac, and superficial external pudendal) and 2 deep branches (profunda femoris and deep external pudendal). The profunda femoris is the largest branch of the femoral artery. It appears from the lateral side of the femoral artery about 3.5 cm below the inguinal ligamentand coils medially behind the femoral vessels. It gives rise to medial and lateral circumflex femoral arteries. The medial circumflex artery goes away by passing between the psoas major and pectineus. The lateral circumflex femoral artery enters laterally between the anterior and posterior sections of the femoral nerve. The deep external pudendal artery pierces the fascia lata and enters medially behind the spermatic cord. The femoral vein accompanies the femoral artery. The vein is posterior to the femoral artery in the apex and medial to it at the base of the Femoral Triangle. It gets the great saphenous vein and profunda femoris vein and veins corresponding to the superficial branches of femoral artery. The femoral nerve is located lateral to the femoral artery, outside the femoral sheath, in the groove between the iliacus and the psoas major. About 2.5 cm below the inguinal ligament it divides into anterior and posterior sections which enclose lateral circumflex femoral artery between them. The anterior section produces 2 cutaneous branches- intermediate and medial cutaneous nerves of the thigh. The medial cutaneous branch accompanies the lateral side of the artery; at the apex of the triangle it crosses the front of the artery from lateral to medial side. The posterior section gives rise to cutaneous nerve- the saphenous nerve. It goes downward along the lateral side of the artery. The deep inguinal lymph nodes are generally 3 in number and are located medial to the upper part of the femoral vein. The lowest one is situated below the junction of great saphenous and femoral veins, the middle 1 in the femoral canal (the gland of Cloquet/Rosenmuller), and the greatest 1 in the femoral ring. It’s a funnel-shaped fascial sheath enclosing the upper 3-4 cm of the femoral vessels. The femoral sheath is split into 3 compartments, viz. lateral, intermediate, and medial by 2 anteroposterior septa. The lateral compartment includes the femoral artery and the femoral branch of the genitofemoral nerve. The intermediate compartment includes the femoral vein. The medial compartment is small and called the femoral canal. To measure the femoral pulse, the femoral artery can be palpated just inferior to where it crosses the inguinal ligament. The femoral artery crosses exactly midway between the pubis symphysis and anterior superior iliac spine. When the body reaches the lower extremity, the presence of Femoral Pulse can be felt. The location of Femoral Artery is easy to access because of its superficial location within the Femoral Triangle, making it suitable for a range of clinical operations. One example of such a procedure is coronary angiography. In this, the femoral artery is catheterised with a long, thin tube. This tube is navigated up the external iliac artery, common iliac artery, aorta, and into the coronary vessels. To view any wall thickening or blockages via X-ray, a radio-opaque dye is injected into the coronary vessels. A hernia is defined as “a condition in which part of an organ is displaced and protrudes through the wall of the cavity containing it“. In Femoral Hernia, part of the bowel pushes into the femoral canal, underneath the inguinal ligament. This creates a lump or bulge in the area of the Femoral Triangle and requires surgical intervention to treat.